Thomas Hobbes lived during a momentous period in English history. His Leviathan, a product of those troubled times, was one of the most important and controversial works of the seventeenth century. The English civil war, and the general conflict between royalists and republicans spurred Hobbes to write this, his greatest work. 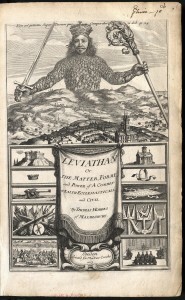 Banned as heretical and seditious and ordered to be burnt by the English Licensers almost immediately after this first edition was printed, Leviathan was reprinted in numerous spurious editions. 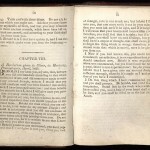 In 1703 it was placed on the Index. For all that, the work was extremely influential, affecting, for instance, the early writings of Spinoza. Thomas Hobbes, writing during the period of the Puritan Revolution (1640’s), rejected the prevalent theory of divine right of kings and supported the idea of a social contract. He believed that the power of the sovereign was subject to certain limits. However, he defended absolutism, unpopular even in his day, as a necessary antidote to anarchy. The individual, then, except to save his own life, should always submit to the State. Later emphasis on the rights of the individual led to a decline in Hobbes’s influence. Even so, Leviathan was a major influence on the framers of the United States Constitution. Thank you to friend of Rare Books, Maria Dobozy, Associate Chair, Department of Languages & Literature, The University of Utah, for sending this glimpse into early medieval bookmaking. P.S. Don’t miss the tags. 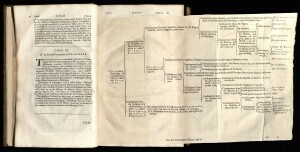 Joseph Smith, Martin Harris, Oliver Cowdery, John Whitmer, Sidney Rigdon, and William Wines Phelps were responsible for the first publication of this work. Phelps, Cowdery, and Whitmer were also on a committee to review the revelations within. 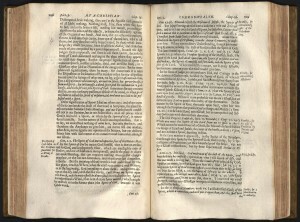 The original publishing plan called for an edition of ten thousand copies. In the end, this number was only three thousand. Printing began in December 1832 and ended on 20 July 1833 when a mob destroyed the type, the press, and the building in which the work was being done. Mary Elizabeth and Caroline Rollins managed to rescue the sheets gathered here. This copy belonged to Hyrum Smith, was then given to President John Taylor, and was preserved by his daughter, Ida Taylor Whitaker. 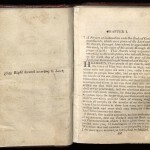 The book then rested in John M. Whitaker’ library and contains his bookplate. Appoximately two dozen copies of the unfinished work are known to exist today. 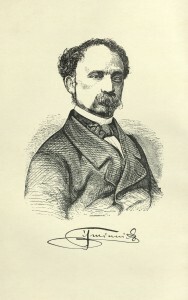 In 1852, Leonetto Cipriani was appointed by the King of Sardinia as that country’s first consul in San Francisco. 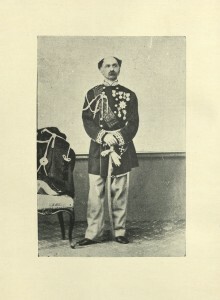 Cipriani, born into a Florentine family living in Corsica, fought against Austria in 1848 and was imprisoned and then exiled. After resigning as consul, he purchased cattle in the American mid-west with the intention of selling them in California. During his cattle drive, in 1852, six years after the Mormon settlers arrived, he passed through Salt Lake City. There, a converted Sicilian, Domenico Ballo, introduced Cipriani to John Taylor. Taylor introduced Cipriani to Brigham Young. In this book, Cipriani reminisces about the Salt Lake Theatre, where Ballo conducted the orchestra, and conversations with Taylor regarding polygamy and politics. University of Utah copy gift of Michael W. Homer. 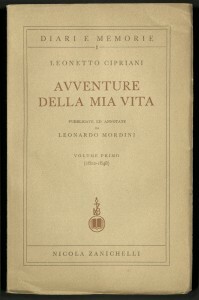 Read more about Leonetti Cipriani here, on the Italian Consul General in San Francisco’s blog. 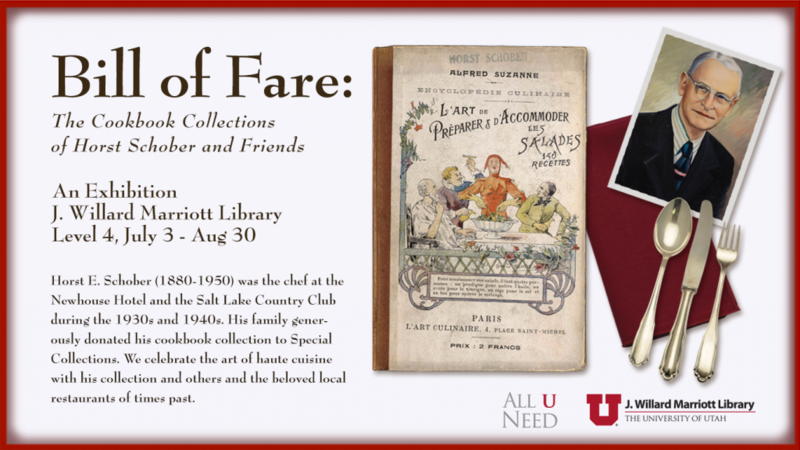 Read an abstract of his memoirs from On the Way to Somewhere Else, published by The University of Utah Press and edited by Michael W. Homer, member of the Marriott Library Advisory Board and ever-faithful friend of Rare Books. Editor Willem Vorstius, or Vorst, was the son of Dutch Calvinist theologian Conrad Vorst, and a significant Hebraist. Vorstius was a friend of Menasseh Ben Israel. 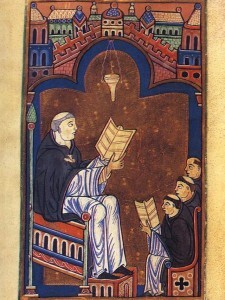 As a Christian, Vorstius was impressed by Maimonides, although he could not accept all of his ideas. 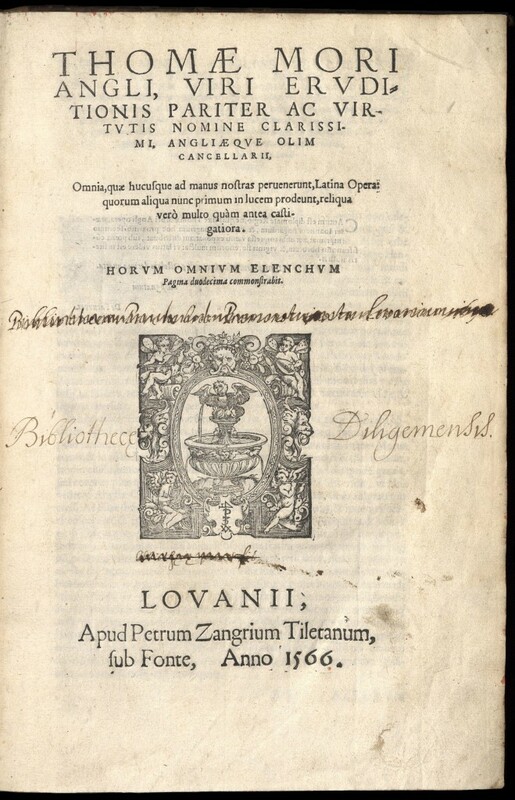 Vorstius used Johann Reuchlin’s De Arte Cabbalistica (1517) as a basis for some of his commentary here. The text of Maimonides is Book I of Mishne Torah, first printed in the fifteenth century, and often reprinted. 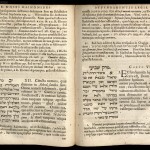 Part 2 of this edition is the Latin translation of Ro’sh Emunah, and contains detailed notes on two chapters only (XIII, and XIV, where some Hebrew is quoted). 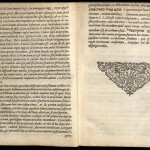 In his preface Vorstius wrote that the most recent edition of the text printed since the Council of Trent omitted certain passages in chapters XII and XIV, supplied, he claimed, from a Venetian edition (possibly the Giustiniani edition of 1547). The Maimonides text is his introduction to his magnum opus, Mishne Thorah, a systematization of Jewish theological thought. The work heavily influenced Spinoza’s metaphysics. In Hebrew and in Latin. Horst E. Schober (1880-1950) was the chef at the Newhouse Hotel and the Salt Lake Country Club during the 1930s and 1940s. His family generously donated his cookbook collection to Special Collections. We celebrate the art of haute cuisine with his collection and others, and beloved local restaurants of times past. 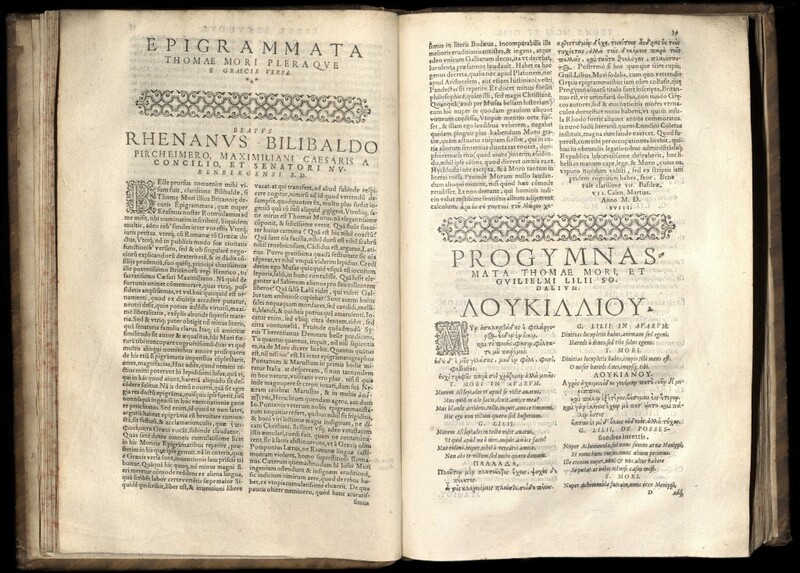 This collection of Thomas More’s works includes the original Latin text of Utopia and is likely the fourth Latin printing of the work. It also includes History of Richard III, on which Shakespeare based his play, and a piece written during More’s imprisonment in the Tower of London. 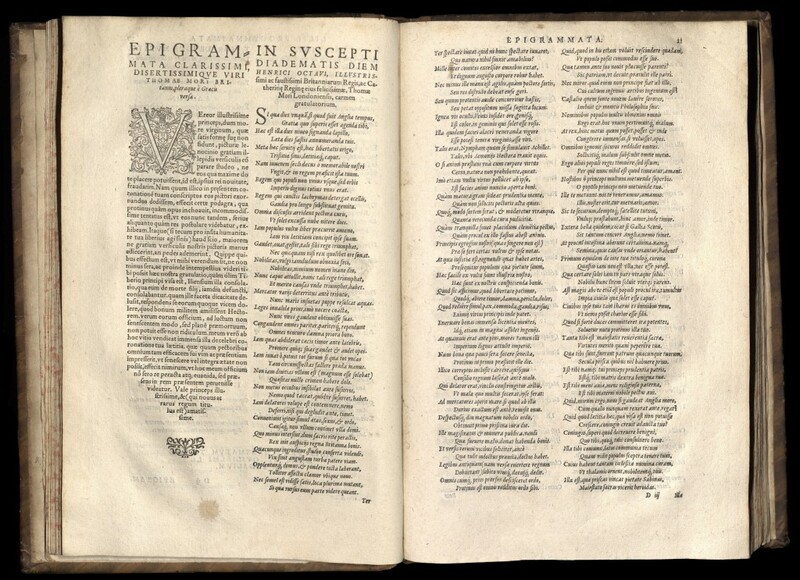 Utopia, first printed in 1516, a satire on the administration of Henry VII, puts forward political and philosophical principles of a fictional ideal state. The literary form, most likely based on Plato’s “Republic,” was later adopted by Francis Bacon and Thomas Hobbes. The title has become a word synonymous with an optimistic but impractical social reform. The book addresses, among other social ills, religious intolerance, extreme punishment for crime, unjust taxation, and disparity of wealth between social classes. The protagonist, Raphael Hythloday, discovers “Utopia” when travelling with Amerigo Vespucci. In Utopia there is no war, no crime, and no poverty. Thomas More refused to subscribe to a new oath required by the Act of Succession (1534). For this, he was cast into the London Tower, where he was kept, tried for treason nearly a year later, convicted and beheaded. 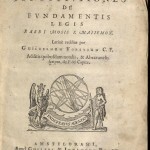 Title-page carries Zangrius woodcut device of a fountain within a historiated fame. Woodcut initials throughout. University of Utah copy bound in seventeenth-century calf with preserved gilded spine. Loosely united in the midst of political revolution and war, the British colonies had no unity whatsoever in currency. 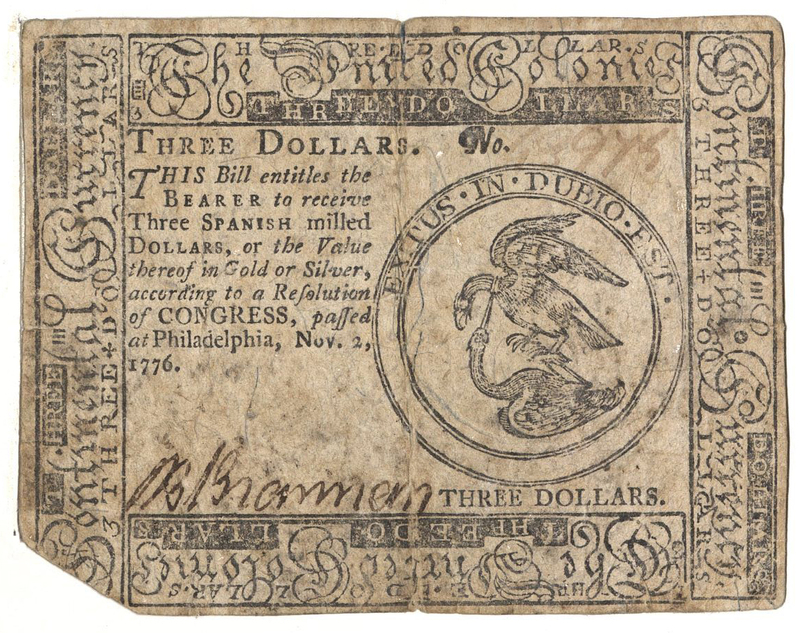 Each colony began printing its own paper currency valued both in British-style pounds, shillings, and pence and in the universally familiar Spanish milled dollar. Each colony valued the Spanish dollar at wildly different rates. In the early flush of independence, the Continental Congress decided to use currency as one indication of sovereignty by launching a standard currency for all the colonies. An emission totaling $4,000,000 payable in Spanish milled dollars, or the equivalent in gold or silver, was authorized by the congressional resolution of February 10, 1776. Of this, $1,000,000 was reserved for the first national fractional currency. The front design on the fractional notes included the first use of the “FUGIO” (I fly) legend and sundial as well as the “Mind your Business” legend. The back showed the thirteen linked rings representing the colonies and the legends “We are one” and “American Congress.” These designs were created by Benjamin Franklin. The devices and border designs were cut by Elisha Gallaudet. On the fractional bills the dots in the corners of the front design reflected the denomination. 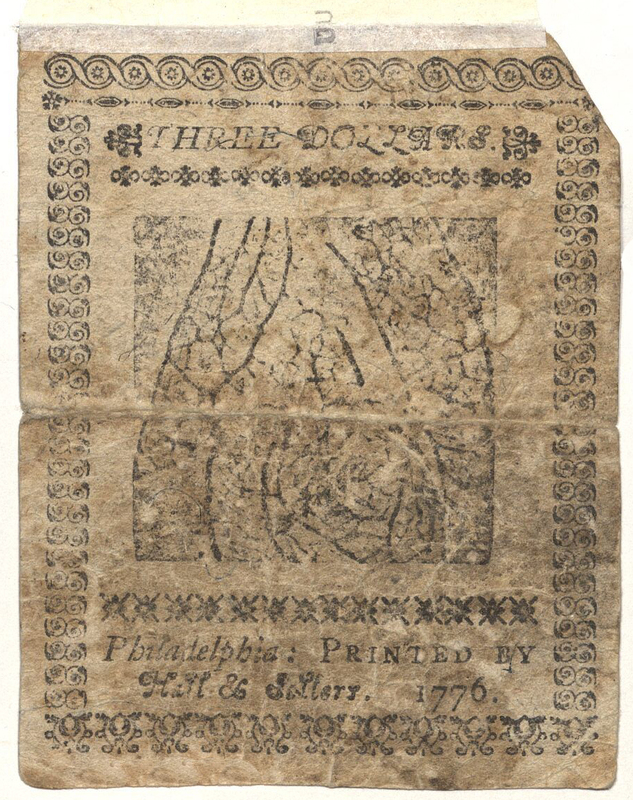 The first four emissions of Continental paper currency from May 10, 1775 through May 6, 1776, included a dollar bill. There was one signer, in red ink, on the fractional bills and two signers, using red and brown ink, on the dollar denominations. Counterfeit detectors for the dollar denominations were made on blue paper. The paper, made at Ivy Mills in Chester County, Pennsylvania, contained blue fibers and mica flakes.